Uptown Phoenix was a hot spot for restaurants, shops and clubs in the 1970’s and ’80’s. Then the cachet fizzled a bit as the Valley’s suburbs boomed. But Camelback Road and Central Avenue, the heart of Phoenix’s uptown area, as well as Phoenix’s Midtown area, are back as a thriving hub for popular restaurants, cool boutiques, office space, light rail and historic neighborhoods and their homes. It’s now the Valley’s most popular intersection, according to a new poll among real-estate and growth experts. 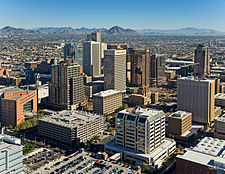 Urban Land Institute Arizona members recently voted the central Phoenix spot the “hottest intersection” in metro Phoenix. It beat out Phoenix’s Camelback and 24th Street, an area that garnered the title the last time the group voted a decade ago. Camelback and Central didn’t even make Urban Land’s top 10 list for hottest intersections in 2007. A lot has changed since then. A boom and bust, light rail and a move toward an urban lifestyle by more Valley residents have shifted our growth. Plus, DeMarco’s group has opened five restaurants, including a Postino, Windsor and Federal Pizza, around Camelback and Central over the past decade. Downtown Tempe’s Mill Avenue and Rio Salado Parkway was voted No. 2 in the hot-intersection contest. The popular urban hub moved from third a decade ago. Matt Mooney, managing director of Cousins Properties, pointed out that Tempe led the nation for filling existing office space with tech firms from 2014-16. Scottsdale and Camelback roads came in at No. 3, after hitting No. 2 the last time. Real-estate attorney Jordan Rose, who has an office at this Scottsdale intersection, said people can shop, eat, work, vacation, get their hair done and even buy a Tesla at Camelback and Scottsdale. Phoenix’s 24th Street and Camelback intersection and the Camelback Corridor tied for fourth. The area is still a hot spot of offices, hotels, shopping and eateries but has a lot more competition now. At No. 5 is the Scottsdale Road and Greenway Hayden Loop area, near the city’s popular airport. Danielle Casey, Scottsdale economic-development director, said there are often “celebrity sightings” at the airport and in the area. The intersection didn’t make the list the last time. Downtown Phoenix’s Central Avenue and Roosevelt near Roosevelt Historic District ranked No. 6 after not making the list a decade ago. The area, known as Roosevelt Row, has recently emerged as a hub for new apartments, condos, cool restaurants, historic renovations and light rail. Washington Street and Central Avenue in the heart of downtown Phoenix ranked No. 7, down from No. 5. The city’s many new high-rises are attracting more residents and offices. ASU’s downtown Phoenix expansion near Garfield Historic District is helping. Gilbert Road and Vaughn Avenue in restaurant-rich downtown Gilbert came in at No. 8. The Gilbert intersection didn’t make the previous list. Phoenix’s 44th Street and Camelback in Arcadia’s prime intersection made the list at No. 9, another new Valley area for the ranking. Because of the tie, there was no No. 10. Four intersections that made the top 10 in 2007 didn’t make the new ranking: Scottsdale Road and Mayo Boulevard; 95th and Glendale avenues; 99th Avenue and McDowell Road; and Price and Willis roads. I thought DeMarco summed up the test for ranking metro Phoenix hot spots really well. “We have restaurants around most of the intersections on this list,” he said. To buy or sell a historic Phoenix Home, contact Historic Homes Specialist, Laura B. today at 602-400-0008. Read about Laura B. here from her client testimonials.